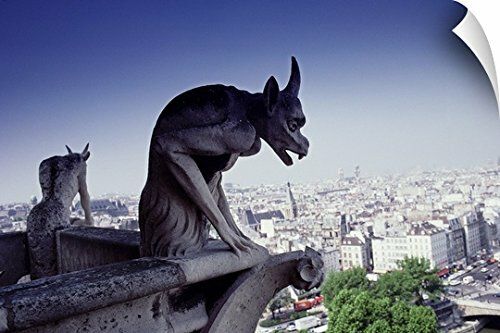 Wall Peel entitled Gargoyle View from Notre Dame Paris. View from Notre Dame towards the Eiffel Tower Paris. Multiple sizes available. Primary colors within this image include Dark Yellow Peach Dark Gray Pale Blue. Made in the USA. All products come with a 365 day workmanship guarantee. Archival-quality UV-resistant inks. Wall Decals are printed on heavy grade vinyl with a matte finish. Perfect for dorm rooms kid rooms doors and other untextured smooth surfaces.